The fédération des gardes paroissiales ("Federation of Parish Guards") is an organisation which will celebrate its 75th anniversary next year and that group together largely autonomous uniformed catholic oranisations mostly in quebec but also in the french speaking parts of new brunswick and ontario. The federation had at it's peak thousands of members but has now dwindled to just below one thousand in 37 units (some were amalgamated due to low membership). The units are mainly visible nowaday as musical marching bands but in former years were quite active (and still are in some villages) in religious and civic events, forming guards of honour, accompanying the local priest during the guignolé and taking care of the collection plates during mass. They also have a more general caritative, mutual-aid and simple fellowship purpose. Although the cut of their uniform is more or less the same (looking similar to the dress uniform worn by most canadian army/police/fire department), the colour of the clothe and embelishement varies from units to units with no two having exactly the same. There is a common rank insignia system used by most units although it should be pointed out that at least 2 units I have seen pictures of used completely different ones. In one case older pictures show them using a different system but more recent ones shows them using the common one so their might be an attempt at standardisation. - Colonel: Président de la Fédération, Commandant Général, Aumônier de la Fédération (head chaplain for the federation). Position at the federation level are indicated by a red armband with the position's name in yellow, at the union level by a yellow armband and at the unit level by a patch worn on the upper arm below the unit emblem. The Présidents, Commandants and aumôniers at all 3 levels wear a fourragère (usualy yellow but in some cases white) around the right shoulder while the other officers wear one around the left. Last edited by marcpasquin on Thu Nov 07, 2013 3:13 am, edited 1 time in total. Note the yellow armband worn by the president of the Mauricie regional union to the right. 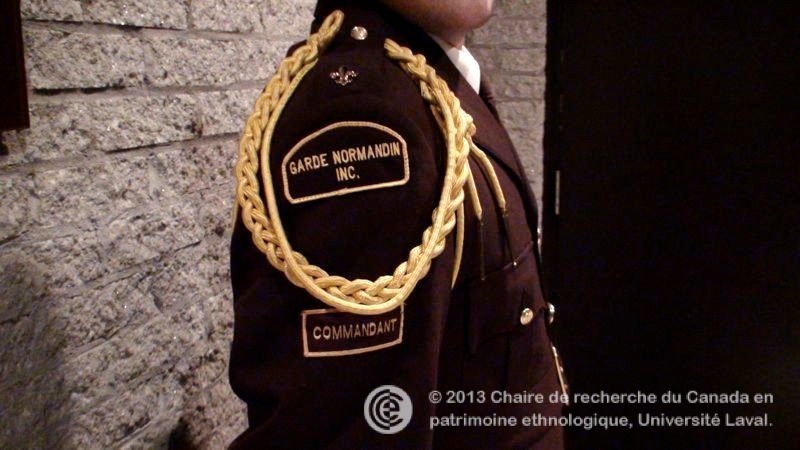 Finally a unit commandant, here of the Garde Normandin (the patch is sown directly to the uniform).